Soon after the 16-cell cyst has formed in the germarium (for details, see Chapter 4), the two cells with four ring canals, pro-oocytes, display synaptone-mal complexes indicative of pachytene in these cells. Serial reconstructions of synaptonemal complexes reveal that all centromeres are positioned near each other on the same side of the nucleus (i.e., they show chromocentral association) (11,12). This kind of chromosomal polarity is typical for mitotic cells and is known as Rabl orientation. While still in the germarium, one of the pro-oocytes in the 16-cell cyst is selected to be the oocyte undergoing meiosis, and the other one becomes a nurse cell. In stages 1 and 2, the centromeric regions of bivalents adhere to a common chromocenter (13-15), followed by incorporation of bivalents into a karyosome during stages 3-6 (16). Karyosome organization is retained until early stage 13. During stage 13, the nurse cells degenerate, providing a means to subdivide the stage into five developmental steps, A-E (7). In stage 13A, the nuclear membrane is still intact and no chromosomal material is seen outside the karyo-some. The nuclear membrane disappears at stage 13B, demarcating the start of prometaphase I. Early at this stage, chromosomal material is still arranged in a karyosomelike body, which is then individualized in bivalents in which centromeric regions are still tightly paired. 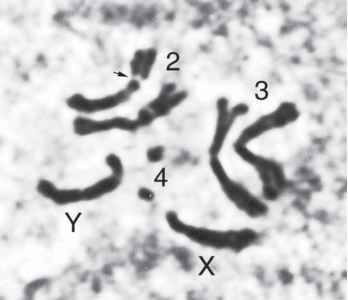 Also, the fourth chromosomes are individualized as a paired structure. The fourth chromosomes and other achiasmate chromosomes are seen detached but still close to each other in mid-prophase, stage 13C. Centromeric regions of chiasmate bivalents are still attached to each other, but pulled toward poles, while the fourth chromosomes are moving toward opposite poles at stage 13D. Full metaphase I is reached at stage 13E, showing a typical arrangement of bivalents and univalents (see Fig. 1); bivalents with homologous centromeres equidistant from the equatorial plane and chiasmata on the plane, and univalents having stabilized size-dependent positions between a pole and the equatorial plane. The smaller the univalent is, the nearer to the pole it lies (7,8). Meiosis I is arrested at metaphase I and this stage is found in all eggs at stage 14.